Every second of every day, the surface of the earth is covered with energy from the sun. Nearly all of the energy on earth comes from it. You can use this energy to cook up any number of tasty and nutritious meals with a simple solar oven. Find two boxes. One of these boxes should fit inside the other, leaving a space on each side of about 2”-3”. This space can vary just a little. You will be filling it with newspaper. Line the bottom of the large box with newspaper and place the smaller box inside. Now fill the space between the boxes with crumpled newspaper also. Line the sides of the smaller box with aluminum foil. Make sure to use non-toxic tape or fold the edges of the foil over the top of the box edge to hold it firmly. Now line the bottom of the smaller box with black construction paper to absorb the heat that will be generated. Add 2” around the trace line and cut out the pattern to make a reflector. Cover the pattern with aluminum foil. Smooth out the wrinkles. Make certain to secure the aluminum foil with non-toxic tape or glue. Staple the reflector to the outside back of the large box. 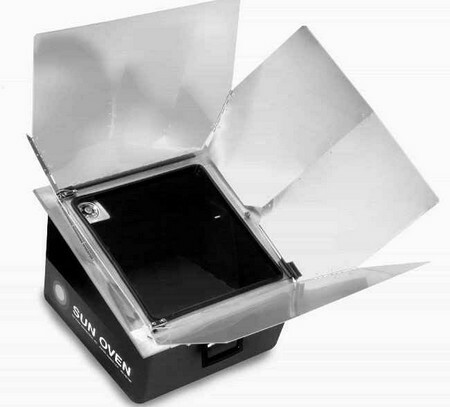 Place the oven with the opening of the box and the reflector facing the sun for maximum exposure. Place the food to be cooked inside the oven. Preheating takes about 30 and cooking time takes about twice as long as a conventional oven. Use bigger boxes for larger ovens and smaller boxes for smaller ovens. Don’t use this type of oven for foods that are frozen, need high temps or that have to be cooked rapidly.